A simple and appetizing pork meatballs with minced shrimp.This meatballs recipe uses singkamas or turnip as an extender. If you are familiar with making siomai, the ingredients on making this kind of meatballs are very similar because siomai uses ground pork, minced shrimps and turnip as an extender. So you can imagine now what these pork meatballs will taste after cooking it. 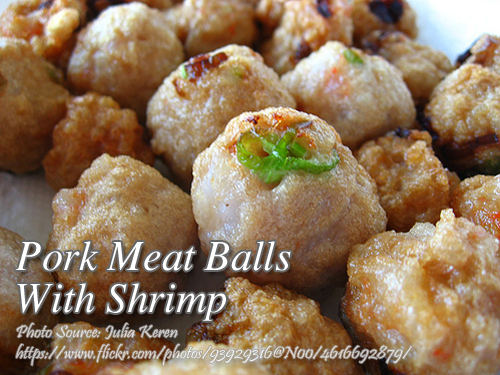 To make pork meat balls with shrimp; Mix all ingredients together and form into ¾ inch balls. Deep fry in hot oil and drain in paper towels or napkins. Mix all sauce ingredients together and serve on the side. The meatballs in this recipe may be used in misua soup. Substitute 1 tablespoon flour for the egg and drop the meatballs in boiling broth instead of frying. Mix all ingredients together and form into ¾ inch balls. Deep fry in hot oil and drain in paper towels or napkins. Mix all sauce ingredients together and serve on the side. The meatballs in this recipe may be used in misua soup. Substitute 1 tablespoon flour for the egg and drop the meatballs in boiling broth instead of frying.